2013 marks the 60th anniversary of the coronation of Her Majesty The Queen. St George’s will celebrate the anniversary in a number of ways. 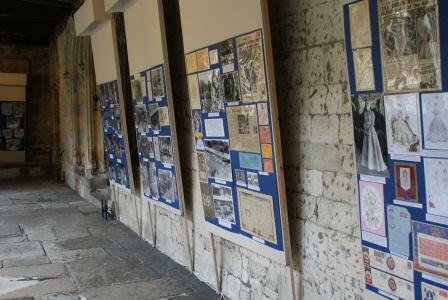 An exhibition of Coronation photographs and ephemera is on display in the Dean’s Cloister until the end of September. The exhibition kindly supported by Stanley Gibbons, will be open during Chapel visitor hours which are normally Monday to Saturday 10am to 4pm. Windsor Castle admission charges apply. The Dean’s Cloister is at the exit from the Chapel. 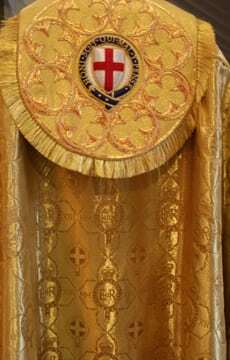 A set of Gold Copes has been made to celebrate the Coronation anniversary. 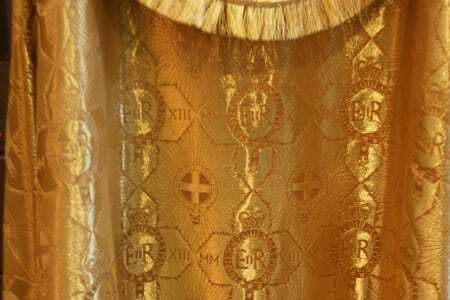 The cloth of gold has been specially designed and weaved and includes the Garter Star together with the Royal Cypher surrounded by a Garter. The Roman numerals MMX111 are also included. The fabric is woven from specially dyed gold silk. The panels and hoods show the St George’s Cross Shield and Garter as used by the College of St George. The badges lie within a replication of the intricate rib vaulting of the Quire roof. Each Cope was made by embroiderers at Watts in London. The project has been supported by a generous gift from Frederick and Jean Sharf. The Copes were first worn at Easter 2013. The bells of the Curfew Tower will be rung at 9am on Sunday 2 June. The Chapel choir performed music associated with Coronations at a concert on Friday 10 May. In September a Windsor Festival Concert in St George’s Chapel will mark the Coronation anniversary. Further information can be found on the Windsor Festival website.